I do not remember the last day of 8th grade. I barely remember the last day of high school- you take some finals and leave when you’re done- it’s kind of anticlimactic. I do remember the last day of 5th grade, though. We all sat on our desks for the last few minutes of class, singing the ‘na na na na’ chorus from “Kiss Him Goodbye” by Steam, as loud as we felt was safe to do. Mrs. Rollins may or may not have been in the room, I don’t remember seeing her there. That was probably because I was so blinded by love and the fact that Chris was HOLDING.MY.HAND. Right there in class, right in front of everyone. He was definitely my boyfriend! I was giddy with the excitement of it all. I knew it would last forever (it didn’t, just in case you were wondering). The bus ride home must have been absolutely torturous for the driver. There’s no control over kids the last couple of days of school- there is nothing you can threaten them with that means anything. No detentions- there’s no time left. Zeros mean nothing by this point. Punishment… they know that the teachers are just as eager to be done with the school year as they are, so punishing them only punishes the teacher. And nothing a bus driver could say, especially on the last day of school, means anything! We jumped in our seats, threw paper at each other, screamed and yelled out the window as one by one, friends and enemies alike stepped off the bus and their summer officially began! Now I’m not sure if this next part is true- well, that’s to say I don’t know if it was true for that day. When the bus finally pulled to a stop outside my neighborhood, I remember leaping from the last step with Shannon and doing cartwheels half-way down the street to my house. Shannon and I were screaming and yelling and laughing and waving goodbye as the bus pulled away. This is a true memory, though I’m not sure if that was the end of 5th grade or another year, but it’s one that still makes me smile because of the feeling of absolute freedom of those first few moments of summer. The WHOLE summer is lying before you- watching TV, maybe a family vacation, the pool with my cousins. Staying up late, sleeping in late… ahh, sweet freedom! Today, as we said goodbye to the kids, that feeling is back… sort of. As teachers, we are still contracted to be here for another three full days. There are grades to finish, classes to clean, lesson plans to be made. But, even with all that, watching the kids leave, some hugging, some crying, some laughing, I have that feeling again- the WHOLE summer lies before me. On that last day of 5th grade, I did cartwheels half-way to my house and then Shannon and I both ran to our respective homes. We had to call our mothers by a certain time or they got worried. Then, we would immediately call each other. I don’t know what we talked about. Probably Chris or our love for the J. twins, and which one of us liked which one of them presently. Or NKOTB. 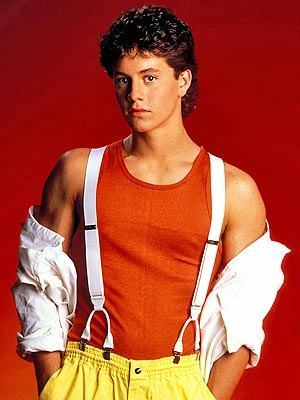 Or Kirk Cameron. The summer itself was glorious in its’ freedom, but kind of boring in retrospect. The funny thing about summer now is that it’s so much more exciting. Summer then actually meant watching a lot of TV, working hard to convince our parents that Shannon and I could hang out together during the day and then RUNNING to get to one of our houses. I wasn’t allowed to answer the phone- if Mom called, she let it ring twice and hung up then I would call her back. For anyone else, I had to wait for the answering machine to pick up and for the person to announce who it was (usually Shannon). I knew exactly when the mail came and that was one of the more exciting parts of the day because I got to run outside to get it. I did chores, usually at 5:45pm, right before Mom got home. Nights were spent in the cul-de-sac near Shannon’s house or riding bikes through the neighborhood. Sometimes Shannon and I still played make-believe, though that was changing more into make-up. Now summer means going home. It still means sleeping late and watching lots of TV, but it also means family and yummy Southern food. It means friends, new babies, lots of hugs and the comfort of speaking English and not stumbling over simple phrases. It means Target. I love summer. I say, for me, it has officially begun.